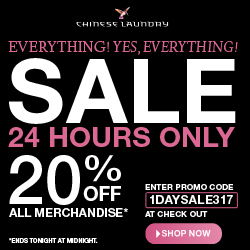 For today only, save 20% on all Chinese Laundry shoes. Here are some hot shoes that just went on sale today. Brand new sales ladies! I picked my absolute favorites to feature and some crazy good prices to boot. From today (April 8th) until the 12th,, Nine West is running a Friends, Family & Fashion event with 30% off all regular priced merchandise. To take advantage of this special offer you must enter NWFRND4 at checkout. Plus, receive free standard shipping on ALL purchases! More Sales & Deals from 6pm! One week sale, 3/14-3/21! 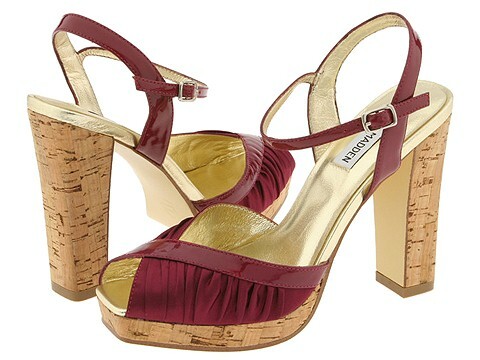 Franco Sarto Footwear All Styles Up to 85% off This Week! One Week Sale, 3/14-3/21! Via Spiga Footwear All Styles Up to 85% off This Week! One week Sale, 3/14-3/21! DC Footwear, Apparel, Bags & Accessories All Styles Up to 50% off This Week! One week sale, 3/14-3/21! DVS Shoe Company All Styles Up to 85% off This Week! One Week Sale, 3/14-3/21! Vans Footwear & Apparel All Styles Up to 60% off This Week! One week sale, 3/14-3/21! Volcom Footwear & Apparel All Styles Up to 55% off This Week! 3/15-3/19 offer! Patagonia Footwear & Apparel All Styles Up to 60% off This Week! 3/15-3/19 offer! The North face Footwear, Apparel & Accessories All Styles Up to 55% off This Week! 3/15-3/19 offer! Mountain Hardwear Apparel All Styles Up to 50% off This Week! 3/15-3/19 offer! Teva Footwear All Styles Up to 50% off This Week! 3/15-3/19 offer! Keen Footwear All Styles Up to 50% off This Week! 3/15-3/19 offer! Columbia Footwear, Apparel & Houseware All Styles Up to 65% off This Week!